Does the study of history make your head spin? Knowledge Quest is here to help! By using maps and other historical timeline events, Knowledge Quest helps kids understand more than just mundane facts about the places important stuff happened; thus increasing understanding and interest in history. The best part about the products from Knowledge Quest? They're fun to use! Map Trek is an atlas plus historical outline maps that allow you to teach geography alongside history. This is a resource that any homeschool parent can use with brilliant success, even if you don't remember a thing from history or geography. Map Trek blended beautifully into our already existing history curriculum. It really became the "where" of our history program, and helped develop a "why" of history. I received the complete curriculum, which is divided into four historical time periods. Ancient World, Medieval World, New World, and Modern World. Each section contains all the maps and lesson plans for the entire section. The lesson plans are divided into three levels: Grades 1 to 4, Grades 5 to 8, and Grades 9 to 12. This was a huge bonus for me as I have four school-age children and I was able to complete the program with each child using the same materials. Depending on the time material we were studying, this year being Medieval history, I was able to find relevant lesson plans and mapping activities for almost every event. I thought this was fun because it wasn't just about memorizing where things were and the names of capitals. I didn't even know it was a review program. I thought it was just part of our history. I thought doing that stuff was fun. And you know what, Mama? I wasn't even mad when James and Isaac got finished before me because I never had to fill in so many names on my maps as they did. I liked doing the extra things more than just filling in the names on the maps and coloring them. You know, like when we made a map with a river and a mountain and when we got to draw the map or the path someone had taken. 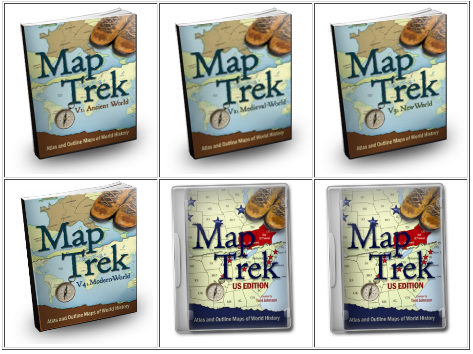 Map Trek is available in many different formats and range in price from $14.95 (single historical time period) to $55.00 (complete curriculum in physical and digital format). I encourage you to browse the website to see the other great product from Knowledge Quest. In addition to other timeline products and historical biographies, they also offer Mobile Apps for your phone or ipad. Other members of The Schoolhouse Review Crew were selected to review different products. Click on the box below or this link to read their reviews. Disclaimer: As a member of The Schoolhouse Review Crew, I received a free copy of Knowledge Quest MapTrek in exchange for an honest review on this blog. received no other compensation.